If ever there was a man born to be Santa Claus it is Phillip L. Wenz. As a four-year-old child, he donned his first Santa outfit. By the time he was fourteen he was in his first parade and at the ripe old age of twenty-four, he became the year-round Santa Claus for the iconic Santa’s Village Theme Park in Dundee, Illinois. It is an association he has now had for more than twenty-five years. Wenz has appeared in nationally televised parades in Chicago and Houston, in TV commercials, and at some of the nation’s largest corporate and civic holiday events. Mr. Wenz’s resume also includes work in Santa Claus, Indiana at the historic Candy Castle, consulting on Christmas programs, and being a published author. 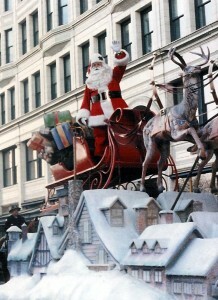 He is considered a leading authority and historian on the Santa Claus legend, history, and folklore. Wenz is, bar none, one of the most experienced Santas in the world and is the creator of the Santa Claus Oath, which is widely accepted by Santa portrayers across the globe. © International Santa Claus Hall of Fame.